Poland has always been known for its tolerance in religious matters, which is reflected by the multitude of beautiful places of worship in Warsaw. Many of these churches were damaged during World War II, but some were left unscathed. Others were rebuilt after the war. 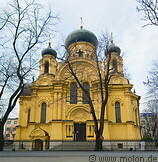 This gallery contains photos of the St. Barbara's, St. Mary Ascension, Holy cross, St. Joseph, Protestant, Our Lady Queen of Poland, St. Alexander, Saviour, St. Mary Magdalene's Russian Orthodox churches and of St. Florian's cathedral.